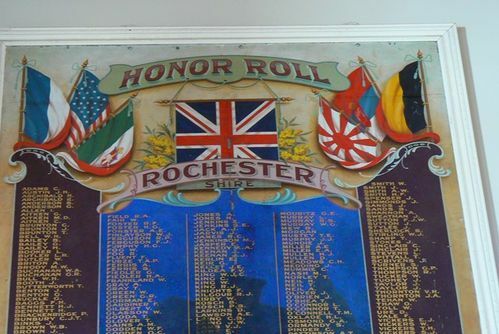 Rochester - The Shire of Rochester`s honor roll, containing close on 500 names of soldiers who volunteered for service at the front, was publicly unveiled in the presence of a large gathering at the Shire Hall on Tuesday afternoon. Crs J. Rankin (president), R Mc Curry, T. McMaster, P. Keogh and Lieut. H. T. Downe, shire secretary, and president of the Patriotic League and ANZAC Soldiers Protection Association) occupied seats on the platform. Proceedings opened with the singing of the National Anthem. Miss Doris Armstrong presided at the piano. Cr. Rankin eulogised the men who had gone forth at the Empire's call and paid tribute to those who had fallen in the fray. They were worthy of all honor. The fact that about 500 soldiers had gone from the shire was a distinctly meritorious achievement. Crs. Keogh and McCurry also delivered brief addresses. Lieutenant Downe stressed the desirability of supporting the men at the front. Owing to the lack of reinforcements, the term ANZAC was being practically annihilated. He exhorted all eligibles to do their duty since, despite all talk to the contrary, Australia had not done enough! (Loud applause). The business places of the town were closed during the unveiling Ceremony, which was carried out by the shire president, the company rising and singing "God Bless Our Splendid Men."